Polymorphism discovery, quality control and sample genotyping followed a process described elsewhere (Manske et al., 2012). Short sequence reads from 3,411 P. falciparum samples included in the MalariaGEN Plasmodium falciparum Community Project (http://www.malariagen.net/projects/parasite/pf) were aligned against the P. falciparum 3D7 reference sequence V3 (ftp://ftp.sanger.ac.uk/pub/pathogens/Plasmodium/falciparum/3D7/3D7.latest_version/version3/), using the bwa program (Li and Durbin, 2009) (http://bio-bwa.sourceforge.net/) as previously described (Manske et al., 2012), to identify an initial global set of 4,305,957 potential SNPs. This list was then used to guide stringent re-alignment using the SNP-o-matic algorithm (Manske and Kwiatkowski, 2009), to reduce misalignment errors. The stringent alignments were then examined by a series of quality filters, with the aim of removing alignment artefacts and their sources. 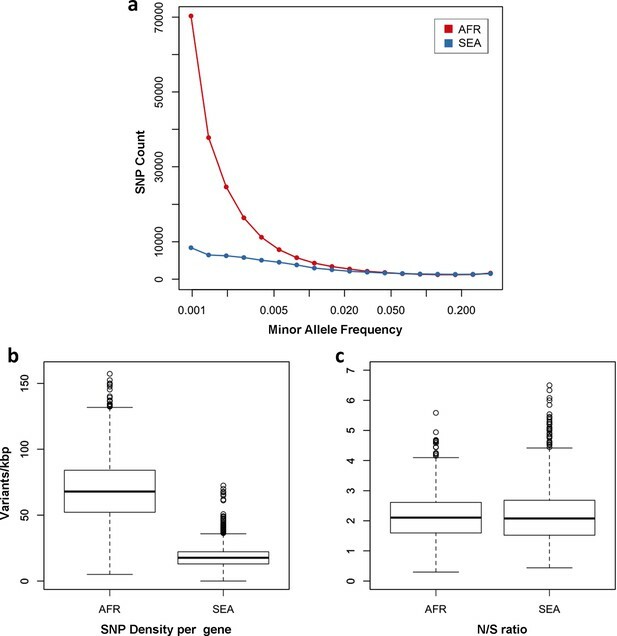 In particular, the following were removed: a) non-coding SNPs; b) SNPs where polymorphisms have extremely low support (<10 reads in one sample); c) SNPs with more than two alleles, with the exception of loci known to be important for drug resistance, which were manually verified for artifacts; d) SNPs where coverage across samples is lower than the 25th percentile and higher than the 95th percentile of coverage in coding SNPs (these thresholds were determined from artifact analysis); e) SNPs located in regions of relatively low uniqueness (Manske et al., 2012); f) SNPs where heterozygosity levels were found to be inconsistent with the heterozygosity distribution at the SNP’s allele frequency; and g) SNPs where genotype could not be established in at least 70% of the samples. These analyses produced a final list of 926,988 high-quality SNPs in the 14 chromosomes of the nuclear genome, whose genotypes were used for analysis in this study. In this analysis, we assumed a mutation rate per base per generation of 3.9e-10 (Claessens et al., 2014) and a uniform recombination map. 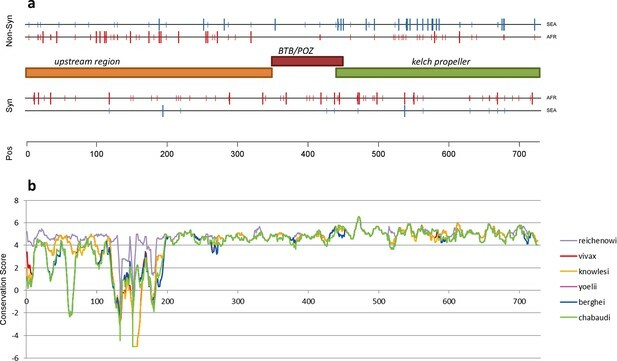 Since the two populations differ substantially in effective recombination rates (Mu et al., 2005), we assumed a conservative recombination rate of 30 kbp/cM. Effective population size was initially set to 10,000 and optimized by 10 iterations of the expectation-maximization procedure (Lawson et al., 2012). 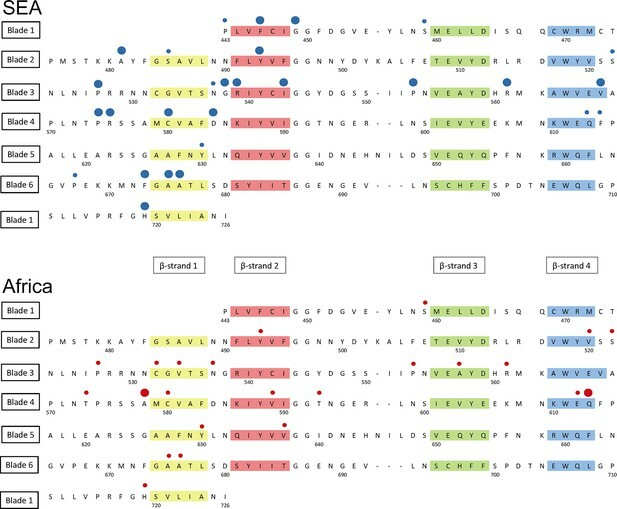 To account for the presence of heterozygous genotypes due to mixed infections, we modified the matrix of emission probabilities by introducing a novel parameter (ε, set to 10-8) to represent the probability of emitting a mixed call. We repeated the analysis varying this parameter set, to assess the effects of misspecification, and results were found to be very similar qualitatively (data not shown). 2) Data availability: the malariaGEN project hosts a comprehensive website for genomic data. However, in the interest of reproducibility and reusability additional files should be provided. We would like to see metadata for all strains included in this study. Ideally, this metadata include sampling date and location, phenotype information where available, the short read archive identifier. Similarly, the source data for figures, such as tables with dN/dS values for genes in case of Figure 5, should be provided. For follow-up analysis a flat file with the genotypes of all strains at the 926,988 high confidence SNPs and their allele frequencies in the different populations would be useful. Such files should be uploaded on data Dryad, or alternatively, a clear description on how to obtain such data from malariaGEN should be given. i. We have added a sentence at the end of the Introduction: ‘Data resources arising from the present analysis can be obtained at <www.malariagen.net/resource/16>.’ This will take the reader to a permanent URL listing all the online resources relating to this study: please see <www.malariagen.net/resource/14> as an example of how this will look. In addition we provide links to specific resources where appropriate in the Results and Methods sections. iii. We provide an Excel spreadsheet containing the source data for Figures 3 and 5. 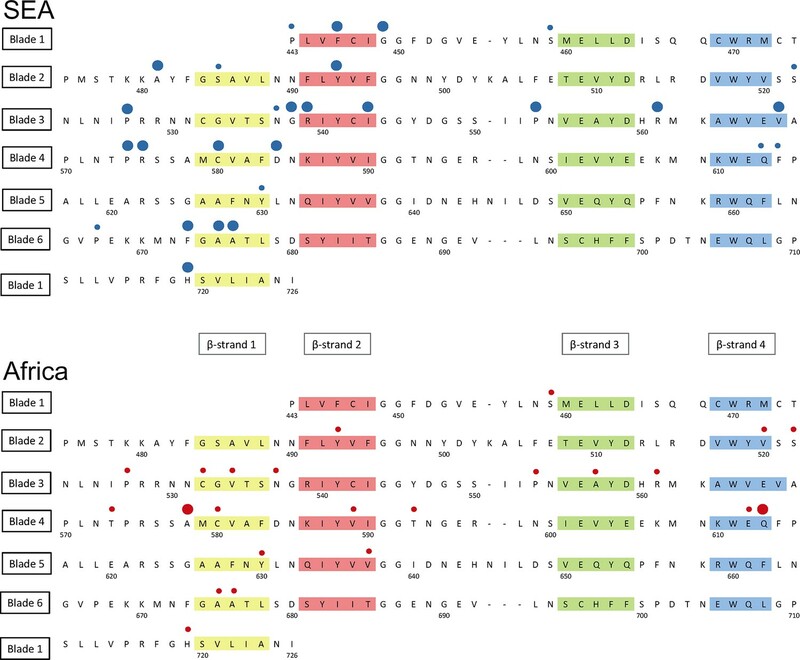 For each P. falciparum gene analyzed, this table lists: the ortholog gene in P. chabaudi, the conservation score, the count of non-synonymous and synonymous mutation in Africa and Southeast Asia, the log fold change and the associated p-value. We propose that this is released as a supplementary file to the paper. iv. 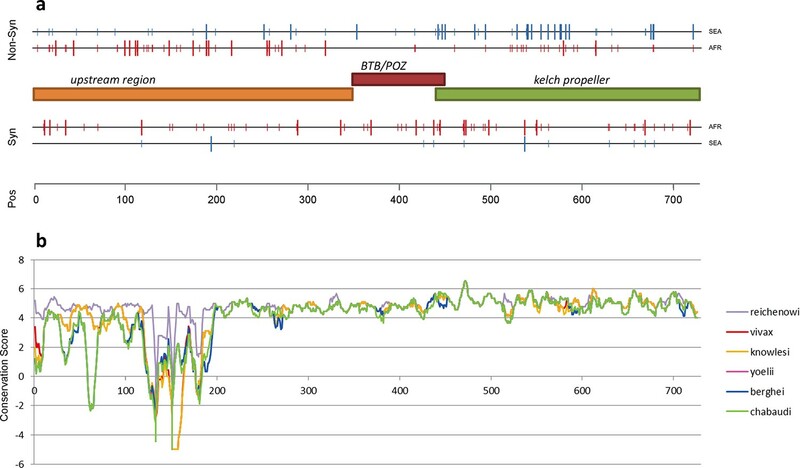 The sequence read data have been deposited in the European Nucleotide Archive (ENA). At the time of publication we will release a sample metadata file on www.malariagen.net/data/pf-sample-info. Each sample will be identified by its ENA accession number, country of origin, year of collection, and by partner study that contributed the sample. v. Many of these samples are also part of the Pf3k Project whose goal is to undertake a comprehensive analysis of genome variation in 3,000 parasite samples representing the major malaria endemic regions of the world, and to make all of these data openly available. 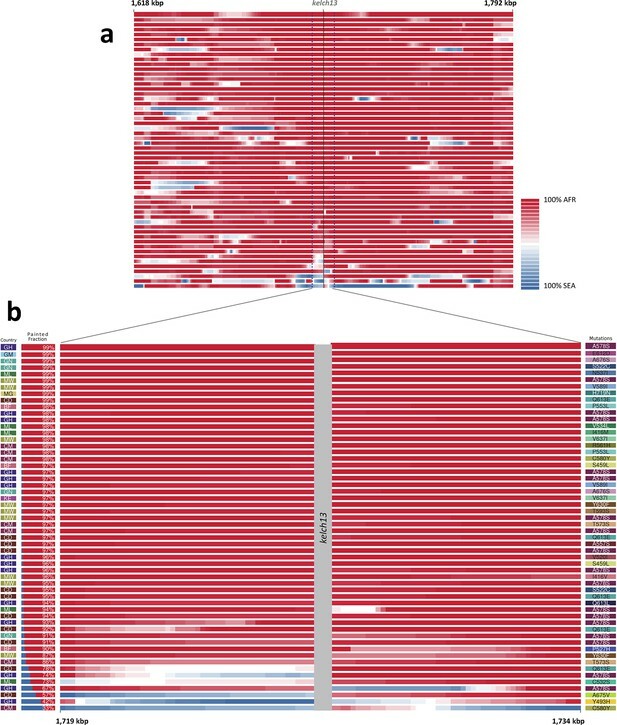 The Pf3k web application provides open access variant call data for 2,375 (68%) of the 3,488 samples included in the present study (www.malariagen.net/apps/pf3k) and these data will be continually improved as new analytical methods become available. The sample metadata file accompanying the present paper will therefore allow users to conduct detailed analyses of individual samples subject to Fort Lauderdale conditions. 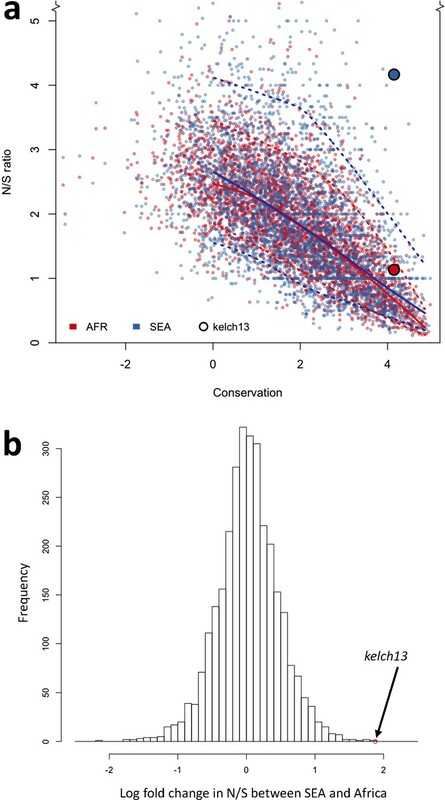 As suggested we have also included a sliding-window FST analysis (Figure 1—figure supplement 1 ) which shows that the differentiation between Africa and SE Asia is fairly evenly distributed across the genome. 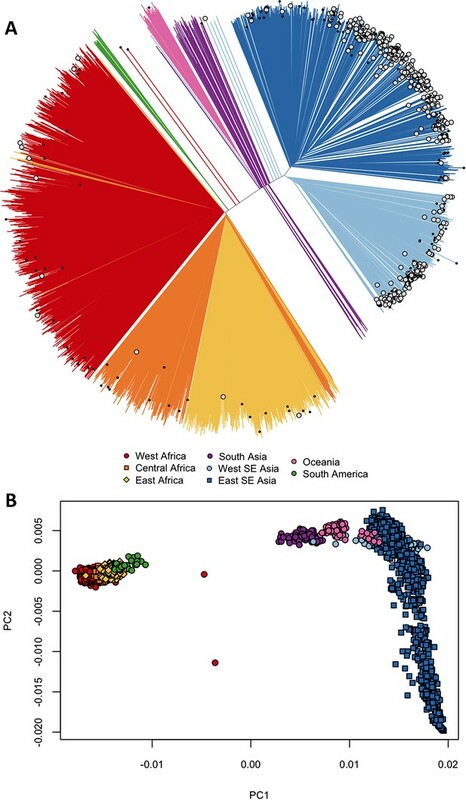 At the pfcrt locus, for example, FST between Africa and SE Asia is relatively low, possibly reflecting the spread of chloroquine resistance haplotypes from SE Asia to Africa. Around the kelch13 locus there is a much stronger signal but closer inspection reveals that this is not due to kelch13 mutant haplotypes (which are diverse and present in only ~30% of SE Asian samples) but to nearby alleles that are close to fixation in SE Asia and presumably antedate the kelch13 soft sweep (see, for example, www.malariagen.net/apps/pf). Thus the results of sliding-window FST analysis are not as easy to interpret as the reviewer implies, and we would suggest including these as supplementary to Figure 1.